Aucklanders love golf. It's in their genes to spend days hitting balls along clifftop courses or lush, inland fairways. You can temporarily join a club, do a pay-per-play, or book onto a speciality golfing tour. Golf in Auckland is some of the most spectacular in the world. 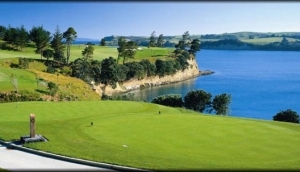 Just south of Auckland, you'll find some prestigious courses, all built to make the most of the amazing coastal scenery. North, and you'll find more ocean-side courses, which often have 5-star hotels attached. For something more leisurely, stay close to the city and make the most of the 40 municipal 9 and 18 hole public courses, which are surprisingly well maintained and affordable. Members golf clubs are plentiful, and most will allow visitors to play as long as they book well in advance and have most of their own equipment. Not all will allow you into their members bar or restaurant after you're done, but they're friendly enough. Even the fearsome Royal Auckland Golf Club will let you tread the well manicured greens if you can ingratiate yourself with another member. If you don't want the fuss, book with a golf tour operator, who will know the best courses to play, and be able to negotiate some great prices.